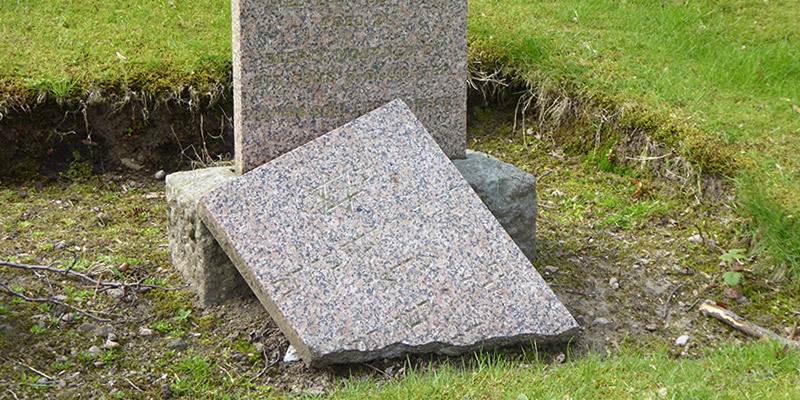 When you have taken time and given careful thought to the design and inscription for a memorial which will be erected in a public area you may wish to consider insuring it against accidental damage by vehicles, if the memorial is positioned near a path with vehicular access, or motor mowers, falling tree branches, vandalism and ground subsidence. Robertson Memorials offer insurance specifically for memorials in public burial grounds. Stoneguard Insurance supplied by Bridge Insurance, underwritten by Sun Alliance, gives full cover for a period of 5 years for a very modest premium based on the value of the memorial (less any local authority fee for granting permission for the placing of the memorial) which is renewable at the end of that period. An insurance certificate will be issued to you and the cover is immediate on the day the memorial is erected. Existing memorials can also be insured by Stoneguard Insurance with the exception of any apparent damage present at the time of insuring. We will inspect your memorial to review this of course. Please be aware that insurance cover does not include normal “wear and tear” or weathering or applied finish to the letters or any ornamentation.